Recognise these TV grabs? Hmm, well, in the midst of Madras Week and the Beijing Olympics (was just watching Usain Bolt strike the second time – and oh boy what a 200m race did he run! 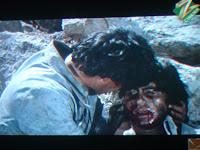 ), I found time to watch Sholay one night. And sat through the film for what must have been the umpteenth time. The dialogues resonated as sharply as ever, dialogues that I had come to learn by heart when I was in school in Calcutta. The magic of Sholay never fails to charm you, does it? 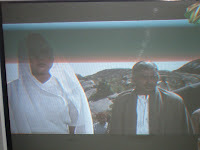 Each of the main characters – Thakur Saheb, Veeru, Jai, Basanti, Choti Bahu, the redoubtable Gabbar Singh and even the others – remains as firmly etched in your mind as ever. And somehow the story never turns stale. Call it the magic of Ramesh Sippy or what you will, but there can never really be another Sholay – not in terms of a repeat but in terms of another movie that can enthrall you decades after it is released. And no scene in any film quite captivates me and brings goose pimples as that magnificent opening scene when bandits astride horses attack the moving train… And whenever I watch that scene, I wish had a 70mm film screen at home! Why do we tolerate corruption?